If you're suffering from jaw pain or impaired function, it may not be the only source of chronic pain in your body. Of the millions of adults with temporomandibular joint disorders (TMD), many have also been diagnosed — among other conditions — with fibromyalgia, rheumatoid arthritis or sleep problems. TMD is actually a group of painful disorders that affect the jaw joints, muscles and surrounding tissues. 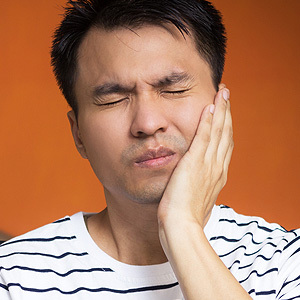 Besides pain, other symptoms include popping, clicking or grating sounds during jaw movement and a restricted range of motion for the lower jaw. Although we can't yet pinpoint a definite cause, TMD is closely associated with stress, grinding and clenching habits or injury. It's not yet clear about the possible connections between TMD and other systemic conditions. But roughly two-thirds of those diagnosed with TMD also report three or more related health conditions. Debilitating pain and joint impairment seem to be the common thread among them all. The similarities warrant further research in hopes of new treatment options for each of them. As for TMD, current treatment options break down into two basic categories: a traditional, conservative approach and a more interventional one. Of the first category, at least 90% of individuals find relief from treatments like thermal therapy (like alternating hot and cold compresses to the jaw), physical therapy, medication or mouth guards to reduce teeth clenching. The alternative approach, surgery, seeks to correct problems with the jaw joints and supporting muscles. The results, however, have been mixed: in one recent survey a little more than a third of TMD patients who underwent surgery saw any improvement; what's more alarming, just under half believed their condition worsened after surgery. With that in mind, most dentists recommend the first approach initially for TMD. Only if those therapies don't provide satisfactory relief or the case is extreme, would we then consider surgery. It's also advisable for you to seek a second opinion if you're presented with a surgical option. Hopefully, further research into the connections between TMD and other inflammatory diseases may yield future therapies. The results could help you enjoy a more pain-free life as well as a healthy mouth. Temporomandibular Joint Disorder (TMJ) is a facial and dental problem that affects between 5 and 12 percent of the population. The symptoms range from mild to severe, and in severe cases it can disrupt a patient’s ability to eat, talk and live in comfort. Find out how the dentists at Carey & Aylawrd, DDS, PC can help you prevent TMJ problems at their Westland, MI dentist office. TMJ disorder is a condition that involves the hinge that connects the upper and lower jaw. The joint (hinge) becomes irritated or inflamed, causing discomfort and a number of inconvenient symptoms. It causes pain, swelling and a clicking sound when you chew. In advanced cases, it can make your jaw lock so that it’s difficult to open your mouth. This disorder can develop due to arthritis or a poorly aligned jaw, but it is most often caused by grinding and clenching your teeth. If you grind and clench your teeth (also called bruxism) while you’re sleeping or when you’re frustrated and stressed, you could be at risk of developing TMJ problems. The best way to prevent TMJ is to get a custom fit mouth guard made at your Westland, MI dentist office. This mouth guard forms a barrier between your upper and lower rows of teeth so that you can no longer clench them together. Over time, it can help you get into the habit of resting your teeth together normally. The process of getting a custom fit mouth guard is a very simple and straightforward process that will take two relatively short appointments. At the first appointment, the dentist will take an impression of your teeth to send to the lab. At the second appointment, you’ll be fitted with your custom-designed mouth guard. Your dentist will provide you with detailed instructions on how you can use this dental tool to prevent TMJ symptoms. If you grind and clench, it’s important to stop this habitual behavior in its tracks to avoid developing TMJ problems. Schedule an appointment with Carey & Aylward, DDS, PC at their Westland, MI dentist office today by calling (734) 425-9130.